I have redone all of my Euchre Rotation Charts to better meet everyone's needs :-) The more players there are, the more complicated they get! So MANY thanks again to my husband who is a Microsoft Excel "expert" ... I could not have done this without him!! Players will have every other player as a partner if you play all the games for 8, 9, 12, 13, 16, 17 & 20 player rotation charts. This is not possible in the other rotation charts because of sit outs. Usually, if possible, players will not be at the same table more than twice in a row. My Euchre Rotation Charts are generic so can be used as is with no extra effort involved. I added additional games to many of the Euchre Rotation Charts so that players would have every other player as a partner. Some of my readers prefer to only deal around once and play more games so that players will have every other player as a partner. Feel free to use the charts as they best meet your needs. 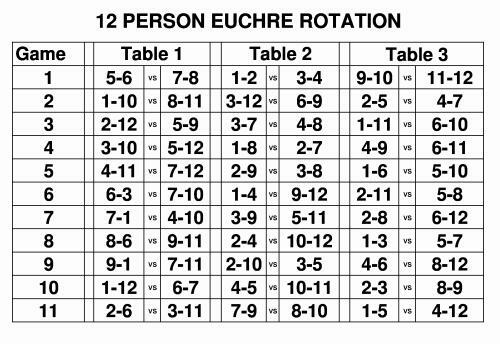 Click links above to print the Euchre Rotation Charts. (After opening PDF page, click printer icon to print.) The Euchre Rotation Charts and other printables for your Euchre Tournament or home Euchre card party are available on the Euchre Printables page. If you have more than 20 players, check out some other options for assigning Euchre partners for a larger group.